Released: September 2012. Genre: Scrolling beat 'em up. A quick peek at Double Dragon Neon’s reception on Metacritic reveals a scrolling beat ‘em up that the critics couldn’t seem to agree on. Its 72 average splits a wildly divergent set of verdicts; some marking it as low as 3 and 4 out of ten, and about as many again bestowing 8s and 9s (or their equivalents) upon the game. Was it that this most quintessentially 16-bit of genres didn’t resonate with the modern reviewer? Or conversely, could the higher scores have stemmed from more experienced writers appreciating the re-emergence of a long-revered, iconic arcade brawler? Maybe it’s a bit of both, or perhaps the scrolling beat ‘em up itself sits a little uneasily these days amongst the current crop of lengthier, more involved titles lining the shelves. It’s a difficult one to fathom, partly because repetition and simplicity, so often by-words for negativity, are much less of an issue in scrolling beat ‘em ups where accessible, pugilistic (and usually co-operative) fun is usually what’s on the menu. Double Dragon Neon takes a little while to get up to speed and is a little clunky around the edges, there’s no denying it, but it really gets what such a reboot should be about. For retro junkies and those harbouring fond memories of the better versions (i.e. not the Mega Drive abomination) of DD, this will push all the right buttons. Billy Lee has had his girlfriend Marian taken away by a gang of thugs, and it’s up to him to save her, either single-handedly, or alongside his palette-swap brother Jimmy. The template is familiar; punch, kick, jump and various combinations thereof making for the meat and potatoes of the experience, whilst bashing up the scenery reveals a plethora of impromptu melee weapons and regenerative items to be made use of. Beating certain foes will see them drop mixtapes, of which two can be equipped at any one time; one for specific attributes, and one for a special move. It’s a pretty cool idea, as you can opt for a setup that reflects huge power but defensive vulnerability; lots of magic so as to allow for more special moves; or one that allows you to regain a bit of health for every successful hit landed. The specials range from Street Fighter-esque fireballs, spin-kicks and knee-drops, to the calling of fantastical dragons and lightning bolts. And they’re more than just an additional extravagance, as particular levels suit different specials. It’s quite a bit of fun all-told, especially with a mate. Co-op moves include the lesser-used High-Five, splitting the players health bar (useful if one is in trouble) and an absolute life-saver (literally) that allows a player to resuscitate a downed teammate, a crucial feature that will save a stack of lives. The range of enemies, though a little limited in the early stages, soon comprises of a bunch of tricky customers, such as fan-flinging Geishas and jetpack-adorned nutters. Should you work out the necessary tactics, you’ve got the tools at your disposal to defeat them, with a top-notch dodge feature allowing time to take avoiding action. General movement is a touch wooden, and on stages where there are more platform elements and drops to negotiate, it can feel a touch lethargic, but only on occasion. Combat is sturdy and there’s a glut of cool sequences to enjoy. The airlock proved a personal favourite; here, everything periodically gets pulled towards an opening into space. Precarious, but mega-satisfying when you manage to sweep an opponent off their feet at just the right time and see them disappearing through the background. It’s one of those wonderful stages that’s like a bonafide flashback to the genre’s coin-op heyday. Double Dragon Neon sports some enjoyably madcap (and superbly designed) bosses, among them the million-missile helicopter that adopts some rather bonkers upside-down, blades-to-the-ground tactics; a gigantic tank-come-fortress and a deadly plant with ridiculously funny flowers adding a further sprinkling of oddity to proceedings. Visually it’s bright and knowingly garish, with an impressively broad set of locations covering urban, rural and outer space. The animation is nice enough, but as with a lot of cartoon-styled HD titles, it has slightly too clean a finish, and a lot of the surface details look a bit bland. Nevertheless, on the whole, WayForward have got the eighties arcade vibe down to a tee; there’s even a thumping soundtrack and lame-dude voice-acting. They really don't like it when you break the screens. Despite the Lee brothers’ karate and copious amounts of air-guitar, it’s arch-villain Skullmageddon who really steals the show. Just as with the game itself, this eccentric, camp magical skeleton gradually wins you over. Not only does he make for a brilliant last-boss battle that’s up there with the best game-closing encounters of old, but he’s funny and enigmatic, not just a generic bad guy. 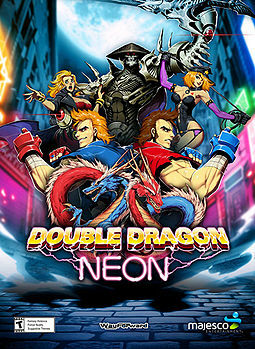 WayForward Studios have judged the tone perfectly; rather than glossing over some of the genre’s shortcomings, they’ve embraced the lore Double Dragon Neon is buying into, making for an endearing and genuine experience. Skullmageddon reveals in a marvellous moment of pathos that he kidnapped Marion because he was after “a date”, and also bemoans how the player “murdered countless Williams’s” in reference to his army of clone thugs. Nothing quite prepares you for the ending however, as beating the game sees the antagonist perform rock ballad “I Dared to Dream”; a brilliantly funny ditty up there with GLaDOS’s effort in Portal, and by the end, you’re left feeling almost sorry that you beat him up so much. Almost. As with Scott Pilgrim vs. The World, DDN opts for a levelling system that allows you to enhance your character with extended play. It treads an uncomfortable line between the new and the old, never quite bridging the two. Building up character attributes and a wide array of special moves is fun and acts as a fair incentive, but it also means that, should you want a spontaneous session on the harder levels alongside a friend who hasn’t previously played, they’re forced to play as a character who is significantly weaker due to a lack of mixtapes. Okay in the single-player, it’s quaint and ill-fitting when there’s two of you, and rather rules out playing on the higher difficulties (or indeed levels) until you’ve got two sturdy profiles running in tandem. Unlike a lot of scrolling beat ‘em ups though, DDN does feel like it’s built to last. A whopping ten stages mean it’s almost twice the size of its average competitor, and with extra difficulties to unlock and tapes to upgrade, there’s probably fifteen to twenty hours of play in here if the mood grabs you. It doesn’t quite scale the pugilistic heights of Streets of Rage or Final Fight, but for a modern-day equivalent, there are few that pack as big a punch.